A nationwide survey has highlighted significantly different response times by councils when it comes to filling in the most severe potholes, with three quarters adopting a risk-based approach. While Cumbria, Flintshire and South Lanarkshire councils aim to act ‘immediately’ to repair potholes that pose the greatest risk to the state of the road and the safety of drivers and riders, Coventry City Council's stated policy is to aim to intervene within five days. Between the two extremes, Harrow Council sets a target repair time of half an hour, while a further 16 councils aim to patch things up within an hour, and five within 90 minutes. The most common response time to the most urgent problems is two hours, with 79 councils looking to patch up the road within this timescale, the transport policy and research organisation said. It acknowledged that response times to the most serious defects will be influenced by how many miles of road a council has to manage and the geographical size of its area. He suggested that those particularly vulnerable to potholes such as cyclists and motorcyclists ‘might ask whether the speed of pothole investigation should be based solely on the risk to users’. 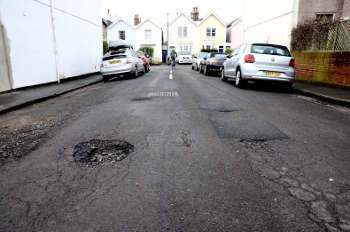 The Foundation pointed out that under a risk-based approach the type of road a pothole is on, the volume of traffic that road carries and the mix of road users will be taken into account, as well as its width and depth. It said that based on data from 190 of the 207 local highway authorities in Britain, 75% (142) had already moved to a risk-based approach by last Autumn, with a further 15 (8%) saying they were about to move to the new approach or were reviewing their existing practices. Nevertheless almost all authorities still set minimum investigation levels – based on depth and width measurements – below which they will not assess potholes or assign response times based on the dangers they pose. Again, these investigation levels vary considerably. While 37 local highway authorities said they would investigate further when a pothole was between 20-30mm deep, 26 said the depth had to be at least 50mm or more. Mark Stevens, chair of ADEPT’s Engineering, Board said: 'The RAC Foundation Report reinforces the fact that there is no agreed national standard for the size of a pothole. With the introduction of the Well-managed Highway Infrastructure code of practice in 2016, local highway authorities were clearly steered towards following a risk-based approach to highway maintenance. 'Whilst fixing the most dangerous first is a positive step, the approach means that the development of a consistent view on what constitutes a pothole is even less likely. 'A longer-term, consistently higher level of investment in the local roads network is required to address the estimated £9.3bn road maintenance backlog. Local highway authorities can then make the country’s local roads safer, reduce the risks to road users such as cyclists and reconsider a standard definition of the size of a pothole.